Could I ask for help with this question please? It is the proof that the modulus of elasticity = W that I cannot achieve. If I assume this then the second part is fine. I appreciate this is not a purely mathematical question, my error may be physical not mathematical - but my suspicion at the moment is that the question is in error. My reasoning is that elastic potential energy (EPE) will be put in to the string in the act of stretching it over the bowl - I will calculate this, call it E1. Then further EPE will be introduced when the weight W descends to meet the bowl - call the total EPE in the string after the weight has descended E2 -I will calculate this too. Then E2 - E1 = loss of potential energy of weight. I'll leave it in this form for convenience later on. Is my physical reasoning incorrect? If not, have I made a mathematical mistake(s)? which is the required result. If a quantity is proportional to another quantity then each or both of them can be measured such that their constant of proportionality is normalized (i.e. equal to unity). This solution remains correct since the problem does not restrict you to deduce the required result for particular unit of weight. The reason I put the right angle in there is because points A and B lie on the diameter of a circle and point C on the circumference of that circle and so ACB is the angle subtended by the diameter of the circle which is 90 degrees. or the book is wrong. If I am wrong then could it be in my assumption that the weight falls vertically so that C lies below its initial position? Might C not be moved to the left or right by the string as it falls? If your assumption is correct (i.e. the weight should be measured using the common units) then maybe there is something which I didn't notice. Hi, Thanks for all the help. I sourced some help on this, It can be done as follows. It was because I wasn't sure of the angle of the reaction that I went down a conservation of energy route in the first place. I still don't really see why one result differs from the other. so you have to use a weight W>w to calculate the gravitational potential energy which is "exactly" W=c w.
where k is a constant. Notice that we have treated the modulus of elasticity as a "constant". However, the particle could have any weight!! which is a contradiction. This leads to the conclusion that the modulus of elasticity depends in fact on the force applied to the string and since the force F is variable the modulus of elasticity is also variable. This should be taken into account in the previous calculation which makes it much more sophisticated. 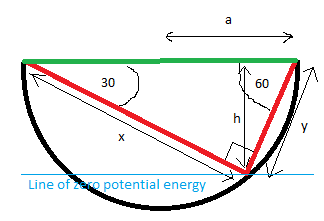 Therefore, the second argument which based on the Hook's law is much more simple than the conservation of energy mothed. I hope that will answer your question.